Chuir an seinneadair cliùiteach Julie Fowlis agus Probhaist a’ Bhaile Mhòir Alasdair Greumach làrach-lìn tionnsgalach air turasachd chultarail gus na ceanglaichean eadar Gàidhealtachd na h-Alba agus Gàidhealtachd na h-Èireann air bhog ann an Inbhir Nis an ath sheachdain. Agus i dìreach air tilleadh bho Dhuaisean-ciùil na h-Alba mar a’ chiad neach-ealain Gàidhlig a fhuair urram taobh ri urramaich leithid Annie Lennox, Paulo Nutini agus Simple Minds, nochd an seinneadair à Uibhist a Tuath an làrach-lìn ùr , http://www.turasg.com, aig a’ chur-air-bhog Dimàirt aig Ionad Tasgaidhean na Gàidhealtachd ri taobh Abhainn Nis. Tha TurasG na thionnsgnadh aig pròiseact CheangalG a tha ga mhaoineachadh tro Aonadh na h-Eòrpa agus a tha air a bhith ag obair bho an-uiridh gus mìrean ann an gnìomhachas a chur ris na ceanglaichean cultarail a th’ ann eadar luchd-labhairt na Gàidhlig ann an Alba agus na Gaeilge ann an Èirinn. Is e an t-amas a th’ aig of TurasG fiosrachadh a thoirt don neach-tadhail gu Gàidhealtachd na h-Alba no na h-Èireann mun iomadh cothrom a th’ ann gus eòlas a chur air dìleab is dùthchas suaicheanta nan àiteachan air a bheil iad a’ tadhal. Cuiridh e air chomas don neach-tadhail cuideachd turas a chur air dòigh bho Ghleann Chaluim Chille Thìr Chonaill, far a bheil cùrsaichean cliùiteach Gaeilge Oideas Gael do dh’inbhich gu na Taighean-tughaidh ann an Eilean Leòdhais. Tha an làrach air a cur ri chèile a rèir caochladh chuspairean, le fios air a’ bheatha ri taobh a’ chuain, a’ bheatha air tìr, eachdraidh, creideamh, nàdar,, ceòl is na h-ealainean agus gheibh an neach-tadhail fiosrachadh, faodaidh e sealltainn air filmichean, èisteachd ri ceòl, bàrdachd is aithriseachd agus sealltainn air dealbhan de na comharraidhean-tìre agus làraichean inntinneach. “Tha TurasG na cheum ùr ann an turasachd chultarail sna h-eileanan seo – is e an làrach-lìn agus goireas air an Lìon as tionnsgalaiche is as adhartaiche a chaidh a dhèanamh gu ruige seo mar thaic ri obair luchd turasachd chultarail agus cuiridh e ri làithean-saora luchd-turais.” thuirt Alasdair Moireasdan, stiùiriche CheangalG. 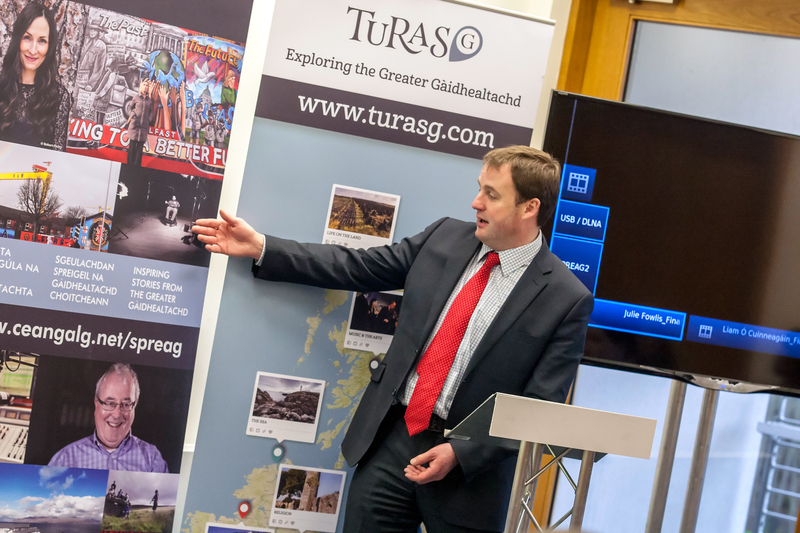 Chuir Probhaist Inbhir Nis Alasdair Greumach fàilte air a’ chothrom don bhaile cur-air-bhog TurasG a chumail, agus e ag ràdh gun robh an làrach-lìn na h-eisimpleir sgoinneil de theicneòlas ùr a’ cur eachdraidh chultarail air adhart. “Tha ar cultar Gàidhlig cudromach dhuinn ann an Inbhir Nis agus air a’ Ghàidhealtachd, mar a tha agus turasachd a tyha mar chaob mòr den eaconamaidh ionadail againn,” thuirt e.
Chuir Manaidsear Visit Scotland sna h-Eileanan, Ailean MacCoinnich, fàilte air cur-air-bhog “TurasG”. “Tha mi cho toilichte mo thaic a chur ri stèidheachadh na làraich-lìn seo air turasachd chultarail, agus bu chòir gun cuireadh i barrachd ris na ceanglaichean Gàidhealach eadar Alba is Èirinn,” thuirt e. “Tha fàilte mhòr air pròiseactan mar seo a chuidicheas gus spreagadh is fiosrachadh a thoirt don fheadhainn a bhios a’ tadhal oirnn mu nàdar, eachdraidh, chultar agus dhualchas na h-Alba, agus tha an làrach seo na cothrom cuideachd eòlas a chur air comharraidhean-tìre agus làraichean inntinneach sna h-àiteachan air am bi iad a’ tadhal”.